Missouri’s rate of gun homicides, particularly in urban settings and communities of color, is among the highest in the nation. Women in Missouri are killed with guns by intimate partners at high numbers. Children in Missouri die from gun violence at rates that are among the highest in the nation. Gun theft is a substantial problem in Missouri. Given Missouri’s alarming gun violence statistics, it is important for state elected officials to reject proposals that would further weaken its gun laws, as well as to consider stronger policies to reduce the already high levels of gun violence in the state. After addressing the above four aspects of the state’s gun violence, this issue brief provides steps, both legislative and executive, to reduce gun violence in Missouri. Children in Missouri die from guns at a rate that is among the highest in the nation. From 2007 to 2016, Missouri’s overall gun-related child death rate was the sixth highest in the nation—62 percent higher than the national rate.32 Specifically, during the same period, the child gun homicide rate in Missouri was the third highest in the nation,33 at a rate of 1.91 gun homicides per every 100,000 children ages 0 through 17—72 percent higher than the national rate.34 Studies have reported that the majority of young children under age 12 who are killed in gun homicides are bystanders in intimate partner violence incidents.35 Therefore, it is noteworthy that Missouri has high rates of both child gun homicide and intimate partner gun homicides of women, as discussed above. Nonetheless, while the number of firearms stolen from gun dealers is alarming, most guns are stolen from private gun owners. 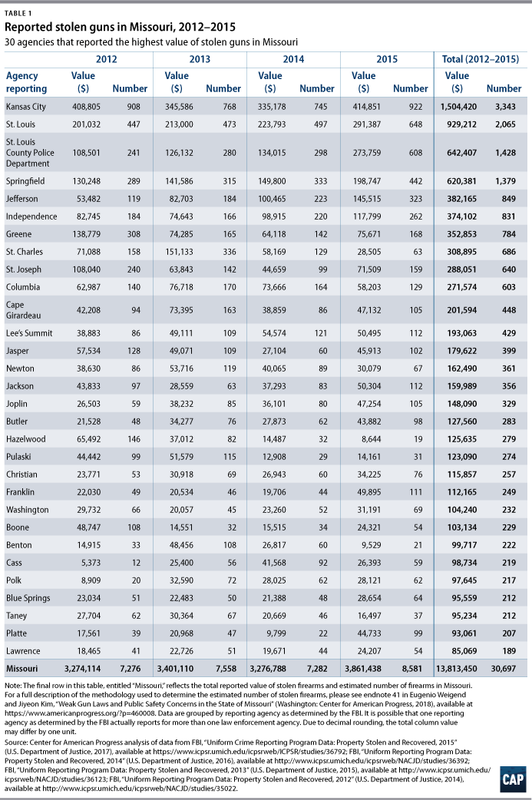 Nationally, it is estimated that close to 1.2 million guns were stolen from private owners from 2012 to 2015.39 The scale of this issue varies from state to state: When compared with other states, Missouri had the 14th-highest number of stolen firearms in the country,40 with an estimated 30,697 firearms stolen from 2012 to 2015—or 1 gun stolen every 68 minutes.41 FBI data suggest that close to 88 percent of stolen firearms in Missouri are never recovered.42 Many of these guns could be used to commit crimes within the state or be illegally trafficked to other parts of the country. Within Missouri, the problem varies widely for state law enforcement agencies, which submit data annually to the FBI’s Uniform Crime Reports indicating the dollar value of property reported stolen in their respective jurisdictions. The data suggest that 30 local or county agencies reported close to 60 percent of the total value of stolen firearms in Missouri.43 Of this share, the agency of Kansas City alone reported close to 11 percent of the total value of stolen firearms in the state. To protect victims of gun violence in the state, Missouri should reject any bill that would further weaken its gun laws. Legislation such as the “guns everywhere bill” is based on myths, and if implemented, such laws would endanger the people of Missouri—particularly vulnerable populations such as communities of color, women, and children. 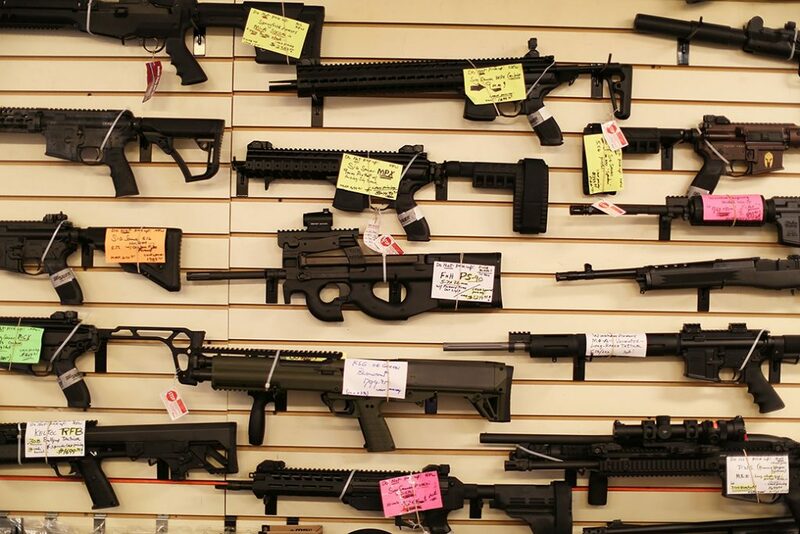 Reinstate permit-to-purchase laws, along with a background check requirement. As mentioned above, there is overwhelming evidence showing the link between the removal of PTP laws and the dramatic increase in Missouri’s rate of gun homicides. Pass legislation that requires gun owners to report any lost or stolen firearms to law enforcement agencies. Laws in Missouri do not require gun owners to report to local law enforcement agencies when a gun is stolen or lost. This facilitates gun trafficking and removes gun owners’ accountability when their guns are connected to a crime. Fund rigorous surveys to identify specific communities at risk of gun violence and projects to develop the most effective methods to reach such communities. Data presented in this brief suggest that specific populations—communities of color, women, and children—are at a heightened risk of gun violence. More rigorous state-level surveys and studies can better identify the exact needs of these communities and uncover hidden risks. Also, community-based projects are necessary to identify and develop the best methods to reach those communities most in need. Implement an effective interagency program to reduce gun homicide. The Milwaukee Homicide Review Commission (MHRC)50 is an example of such a program. It is a multistage interagency homicide incident review system that includes the following components: real-time police review of homicide incidents; a monthly criminal justice panel that reviews the incidents; a service provider review that identifies contributing factors to the incidents; and community review that informs the public and invites public comments on the incidents. The MHRC has been successful in reducing fatal and nonfatal shootings,51 and thus provides an effective model for Missouri state officials to consider. 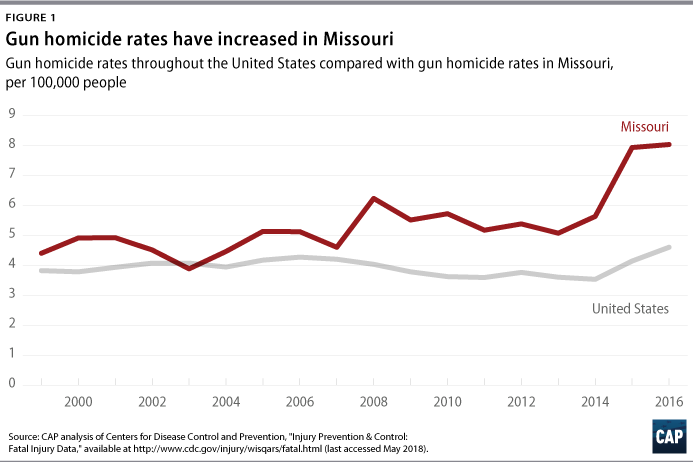 Gun violence in Missouri is an urgent public health problem. Every 10 hours, a person is killed with a firearm in Missouri. State elected officials have an important duty to protect their communities by rejecting dangerous bills and implementing common-sense measures to reduce the number of gun deaths. Eugenio Weigend is the associate director for Gun Violence Prevention at the Center for American Progress. Jiyeon Kim is in her final year of the J.D. program as a Dean’s Fellow and Webster Scholar at Washington University in St. Louis School of Law. Milwaukee Homicide Review Commission, “Annual Report 2015: Homicides and Non-Fatal Shootings” (2016), available at http://city.milwaukee.gov/ImageLibrary/Groups/cityHRC/reports/2015AnnualReportFINAL.pdf.